Hello everyone! 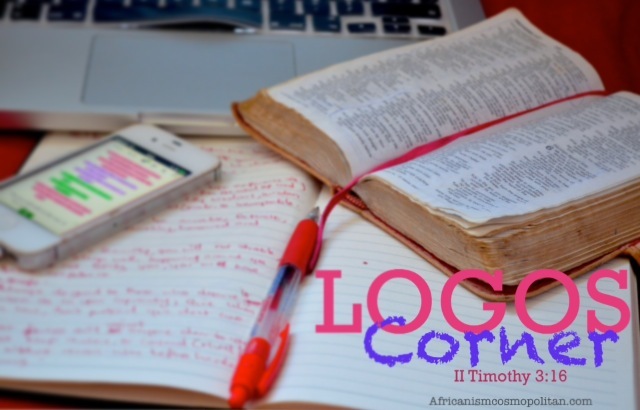 Welcome to this week’s Logos Corner! Before we begin, I apologise about last week Friday, that no post went up for this segment. In the midst of improper planning I didn’t publish a post as anticipated. I do hope I’m forgiven by all who expected a mail alert or constantly refreshed the blog page for an update, my sincere apologies again ^.^ Thank you. To make up I’d be posting two topics this weekend. One today and another on Sunday! So lets discuss today’s topic “Empowered to forgive”. The notes below are infused with a tale of my own conviction, All through the word of God. So get your bibles, notes etc and lets begin! I’ve always been an advocate of letting things go, simply because i’m quite playful hence i’m not easily offended. However it all changed a while ago. I kept a grudge for almost two years even though I assumed I had forgiven the offence. It was through my conviction I properly understood the depth in the saying “Forgive and FORGET”. I would give a preamble of my experience and then discuss how the word of God impacted it. I started my new birth walk with christ mainly in 2010, I studied my bible quite well and since I then attended a university where the word of God was part of the curriculum, my faith and knowledge of God increased. (faith cometh by hearing, and hearing by the word of God, Romans 10:17). Although this did not mean I wasn’t still dabbling in sin, and living a periodic hot/cold life. Hence, when the offence came, I struggled. Even though I knew Matthew 6:14-16 by heart. “For if you forgive men when they sin against you, your heavenly Father will also forgive you. But if you do not forgive men their sins, your Father will not forgive your sins”. The intriguing thing about my years of un-forgiveness was that the holy spirit was constantly convicting (not condemning) me to let go but I didn’t yield myself to him. I would like to exemplify how I was feeling during these times. (Mind you, I sincerely felt in my heart I had forgiven the offender/s). -There were days were I would suddenly remember the events that occurred and I cannot begin to explain the amount of disgust I felt in my heart towards these persons. I felt I was totally wronged, I even felt more upset when I tell my self, “Tosin you’re a child of God you shouldn’t feel this way” because I strongly believed ‘bad things don’t happen to God’s people’ (I still do). However, what deemed the reality of that truth was my perspective. I saw myself as a victim of injustice. I was capitalising on my salvation and the ‘goodness of my heart’ to be a shield from anything unpleasant. I failed to remember that “many are the afflictions of the righteous, but the lord God delivered them from all” Psalms 34:19. I refused to walk through the valleys of the shadows of death to experience victory to the glory of the lord. Psalms 23:4 ” Yea, though I walk through the valley of the shadow of death, I will fear no evil: for thou art with me; thy rod and thy staff they comfort me” (Key word: “YEA” OR “EVEN THOUGH” meaning when/while you walk). I wanted Justice immediately, without being sharpened by the experience/lessons/growth the “affliction” brought. Truthfully, I sought God daily asking him to fill up the void I was feeling and “help me to forget”. Of which I’m sure he probably answered the day I asked. (Mark 11:24 I tell you, you can pray for anything, and if you believe that you’ve received it, it will be yours) But Tosin’s mind was too fixed on the offence, and hence I did not allow his peace to manifest. Over time, I began to understand that forgiveness was not really a voluntary action, but a state of mind triggered by faith in obedience to the word of God. So why did I/we continue to struggle with those feelings? The answer is simple, Because I did not guard my heart and did not trust God to do his Job. Proverbs 4:23 “Guard your heart above all else, for it determines the course of your life”. This scripture answers most of our concerns, I struggled because as earlier mentioned, My mind feasted on the offence/need for Justice instead of believing I had let go by faith. However, I still surrounded my self with the cause of the hurt in the first place. Now, this is where wisdom is profitable to direct. Sometimes letting go means Getting rid- of/discard/dis-communicate from anything, person, items, emotions, that constantly brings back into existence the pain of the past. This brings me to the second part of Trusting God. God really has our best interest at heart, his thoughts towards us are of good Jeremiah 29:11 and its best you’re aware of that. With the understanding that “ALL things works together for good to those who love the lord Romans 8:28, Even when you feel you cant help the pain/ hurt you’re feeling (because you might have been truly wronged) trust God to restore and heal. Not just you but also your offender, who surprisingly may also feel the exact way you feel or might be totally unaware of the gravity of their actions. But, lets discus where I got it all wrong; Failing to understand that no matter the gravity of hurt someone has caused you, God loves them too and you cannot afford to sin due to pain. Hurt can never justify sin. Bitterness/need for revenge is unhealthy, it stems from Un-forgiveness which is a sin. Peter was too right when he said Love covers and as I’d like to say ‘prevents’ a multitude of sin. Not the innate love for man, but the spirit given Love for God which causes you to love everyone despite of your reservations. It’s not earthly, hence your flesh cannot subdue itself to it without the help of a greater force. “Spirit over body”. The love of God makes you to submit yourself to his will. No offence, no pain, no hurt should separate you from that love that cancels all sin. The same love that sent down his son to die for us…..
Forgive because it is a command from God, Forgive so that your prayers may not be hindered(Mark 11:25), Forgive because you love, Forgive because you’ve been forgiven much. Remember when Jesus was speaking about Mary, (Martha’s sister) and he said “ I tell you, her sins( and they are many) have been forgiven, so she has shown me much love. But a person who is forgiven little shows only little love. Luke 7:47. Finally, forgive because many will be shut out of the gates of heaven simply because of a grudge. Its not your job to demand revenge/justice, God knows his Job, Leave it at the altar of prayer and go about your life. I pray that the power of God will uproot anything that has set itself to stand against us in judgement. Amen. May the Lord, who began the good work within you, continue his work until it is finally finished on the day when Christ Jesus returns. Philippians 1:6. Tosin, Tosin, Tosin *in softest of tones*. Amen in mighty name of Jesus. If only you knew the impact yours words have. God bless you and may he continue to strengthen your beautiful, gorgeous self. While reading this, I was trying to figure out if there’s anyone I’m holding something against. No name came to my mind, which I guess is a good thing. Great post though! And to phil 1:6- Amen!! Wow! Glory!! I love the infusion of the word of God. It gave the topic ‘life’. God bless you. Great post Tosin, the thing about unforgiveness it’s that it keeps one unhappy,I have learnt that praying for people who hurt me(not die by fire prayers o) actually helps me Let go and genuinely love them. Wow, what a word. So encouraged by this fresh view of forgiveness. Thank you for the clarity in this post Tosin. They’re people in my life I thought (believed in my heart) that I had forgiven but sometimes I still feel cheated or feel like I didn’t deserve what that person had done. well, I thought it was the normal thing to do because I can forgive but not forget. Thank you for making this clear today, what true forgiveness is all about. Forgive and heal with God’s grace. (Am lazy when it comes to commenting but m always looking forward to your posts 🙂 ) God bless u my dear.